Hi! 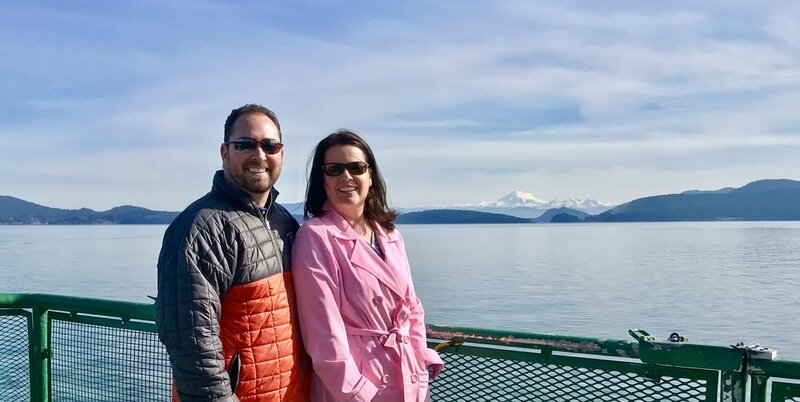 We're Todd & Lori, owners of Orcas Island Getaway, LLC hosting guests at three great vacation rentals on Orcas Island, in Washington's beautiful San Juan Islands. We fell in love with Orcas Island many years ago after a weekend getaway and have been drawn to its magical charm ever since. If you've ever visited the San Juan Islands, you probably know exactly what we felt. When we decided to find a home on Orcas Island, we made few to trips over the course of about a year trying to find the right place for our "weekend escape from city life". The home we found was on the perfect size for what we were looking for. A great layout with 2 bedrooms on opposite sides of the home, privacy with a .75 acre lot and tons of beautiful evergreen trees, and a location with convenience to town and Moran State Park. It met all of our needs, and our vision of what the home 'could be' with some sweat equity was readily apparent to us. We closed on the home on Valentine's Day 2014, and we spent the better part of 6 months remodeling and updating everything in the home over long weekends and vacation days. Our goal was to create a comfortable environment with more contemporary tastes. Although it was a lot of work, we truly enjoyed transforming the house into a home. It was a special place we looked forward to visiting anytime we could, and welcomed friends and family as often as possible. We chose to offer the home as a vacation rental as a way to help offset the costs of the home, but also a way to enable others looking to explore the island a quality home they could relax in at the end of a day full of exploring. Having a vacation rental property on Orcas Island was a dream come true. Being able to 'escape' the city life as well as sharing the home was great. We were honored to have so many positive comments from guests choosing our home to celebrate birthdays, anniversaries, honeymoons and family vacations. We beam with pride hearing how much guests enjoy the home and appreciate the thought and attention we've put into making their experience memorable. But, the popularity of the home as a vacation rental also had a side-effect… it restricted our visits to a place we well in love with! We quickly realized how much we missed visiting the island, but also enjoyed the benefits of hosting a vacation rental. We knew we wanted to live on the island full-time to enjoy its beauty! So, in the summer of 2015, we took a leap of faith and sold our home in the Seattle area, purchased another property on Orcas Island, and we now live on Orcas full-time while offering Orcas Island Getaway @ Bracken Fern as a vacation rental for others to continue to enjoy. In November 2017, we had the opportunity to add another property to the Orcas Island Getaway family with the purchase of a newly constructed northwest contemporary home in the Rosario resort community near Moran State Park. We are now referring to both properties as Orcas Island Getaway, but each with its location at the end for guests to identify. In November 2018, we purchased a new construction right across the street above our original @Rosario location and began welcoming guests at this property in April 2019. It is perched high on the property and has fantastic views of the Salish Sea from nearly every room in the home, not to mention its large deck. We pride ourselves in offering extremely clean, well maintained and user-friendly vacation rentals helping visitors experience the beauty of the islands while offering a relaxing home away from home during their stay. Be sure to check out our nearly 300 reviews from other guests to see what we’re all about. We know you’ll have a great visit! We hope to have a chance to welcome you to one of the Orcas Island Getaway properties soon.